The Milwaukee Brewers’ turnaround in 2018 continues to be recognized. 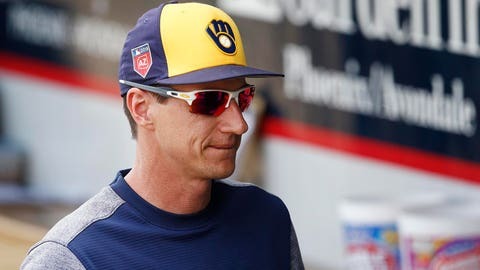 Major League Baseball announced Monday that Milwaukee manager Craig Counsell is one of three finalists for the National League Manager of the Year award. The other two managers up for the honor are Atlanta’s Brian Snitker and Bud Black of the Colorado Rockies. The winner will be announced Nov. 13. Counsell led the Brewers to a 96-67 record and the franchise’s first postseason berth since 2011. Over four seasons, Counsell has registered a .506 winning percentage while managing the Brewers to their first consecutive winning seasons since 2011-12. Counsell’s fiercest competition is likely Snitker, who helped Atlanta turn a 90-loss season a year ago into a 90-72 record and division title this summer. Over the weekend, four Brewers players — Lorenzo Cain, Christian Yelich, Travis Shaw and Manny Pina — were up for a Gold Glove award at their respective positions, but none came away with a trophy.